An author who was so desperate to get his book published that he staged a hoax involving a baby dragon has won a lucrative publishing contract. After numerous rejections Allistair Mitchell concocted a tale that a dragon had been found in a garage last year. He said: "I created the hoax in order to attract potential readers." Mr Mitchell, based in Oxford, has now signed an book deal with Waterstone's for his book Unearthly History, a thriller featuring a dragon. Writing under the pen name PR Moredun, Mr Mitchell concocted the tall tale which emerged in the media in January. It was claimed that German scientists created the specimen in the 1890s and sent it to the Natural History Museum in order to dupe their British counterparts. But, the story went, the museum had dismissed it as a hoax and it had been spirited away by a museum porter. 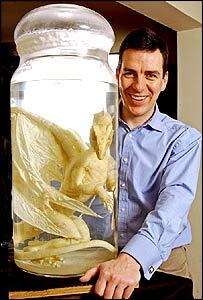 In fact the dragon was created by Crawley Creatures, the model makers behind TV's Walking with Dinosaurs, and the jar was made by a specialist glass blowing studio in the Isle of Wight. A Waterstone's spokesman said: "This is a very refreshing approach to book publishing. "My bet is that it is going to be a big seller - because of the hoax but also because it is a great book and people will recommend it on."